Ai Weiwei wasn’t the only artist using seating as the building blocks for an art installation in Venice last year. 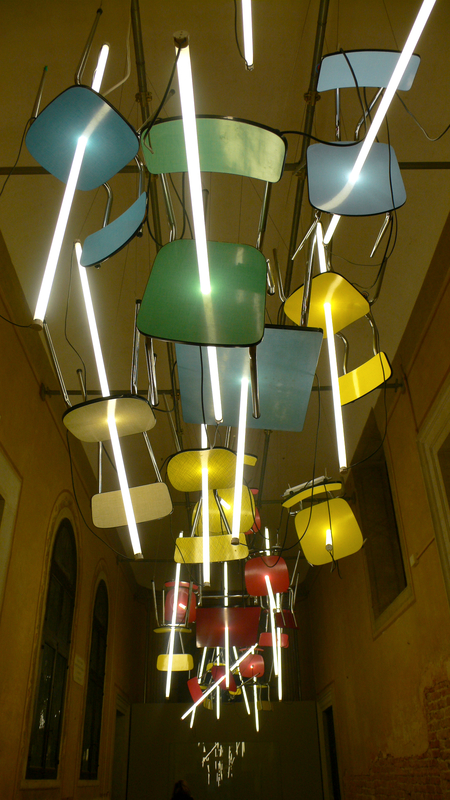 The works in the entrance to the New Zealand Pavilion – held in the Instituto Santa Maria della Pietà – featured suspended chairs and fluorescent tube lights. Culbert, whose work I didn’t really know very well before chancing upon the New Zealand pavilion and wandering in (admittedly I was hardly off the beaten track here, the space was on the waterfront almost no distance from Piazza San Marco), has been working with light since the 1960s. In the work on show in Venice, Culbert used light and domestic objects to create an extraordinary series of installations and smaller sculptural pieces that occupied the space in a really interesting way. Given that this is the season on sparkly lights, it seems timely to remind myself about Joana Vasconcelos’s Trafaria Praia, the Pavilion of Portugal at the 2013 Venice Biennale. 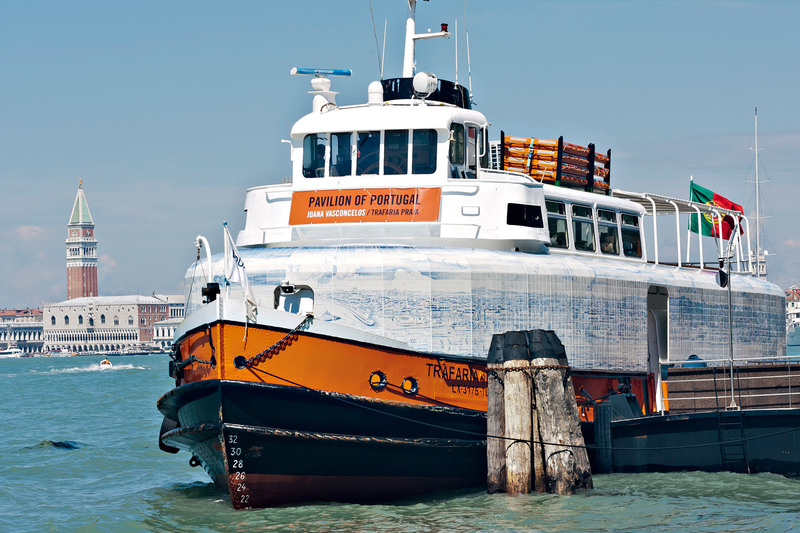 Part art installation, part ferry, this was an unusual space even for Venice. Vasconcelos transformed a Lisbon ferry into an installation that made regular tours of the lagoon. The boat was moored close to the exit of the Giardini – one of the two main Biennale sites and home to many national pavilions – but those who timed their visits right could take a short trip around the lagoon on the Trafaria Praia. Given more time, I suspect I’d have enjoyed the trip well enough but the pressure of trying to see everything I want to at biennale is such that time based works are inevitably tricky and this is a city where being on land is the novelty so my visit to Trafaria Praia was restricted to visiting the boat at its mooring point. Until I boarded the boat I’d kind of forgotten about the excess of Vasconcelos’s work but, even if it’d been really fresh in my mind, nothing of hers I’ve seen before would have quite prepared me for this. Going back to work that transforms the space in an unexpected way, thinking about Martin Creed’s Work No. 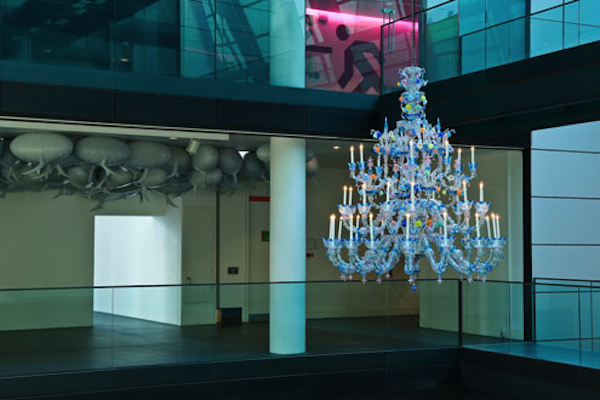 227: The lights going on and off made me think about Cerith Wyn Evans’s S=U=P=E=R=S=T=R=U=C=T=U=R=E (‘Trace me back to some loud, shallow, chill, underlying motives overspill’) which I first saw at White Cube Mason’s Yard a couple of year ago and again recently in a somewhat pared down form at the extraordinary De La Warr Pavilion in Bexhill in Sea. 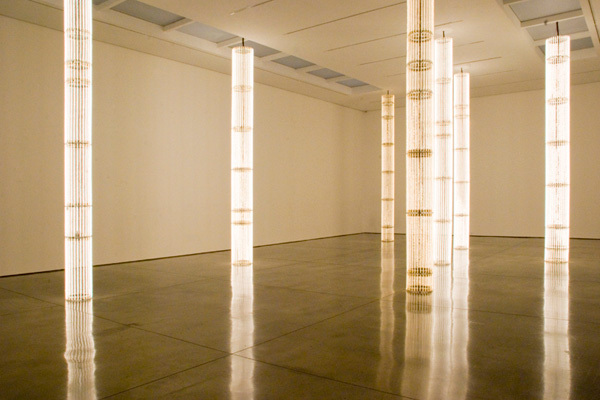 The installation is a series of columns made of lighting filaments running though glass tube. The columns both form obstructions in the room and alter the light levels within it. More interestingly though they generate a huge amount of heat. And, as you may have guessed given the mention of Creed’s installation, they go on and off. Disorientation and an assault on the senses isn’t something I normally associate with Antony Gormley. Figurative sculptures, yes; glass boxes full of fog and confusion, no. Them’s the rules. But rules are made to be broken, I suppose, and the unexpected from an artist you thought you’d got the measure of is no bad thing. 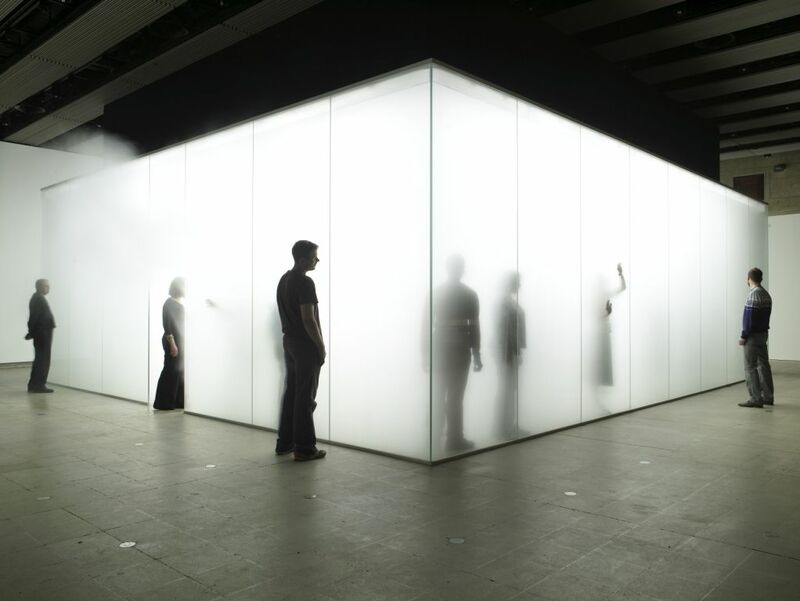 Blind Light is a brightly lit, glass walled room filled with mist. As people enter the space they quickly disappear from view. From the outside occasionally shadowy figures can be seen as they get close to the walls, hands becoming suddenly clear as they touch the wall.